A mid-winter cold snap has hit much of the country, but these episodes are becoming less frequent with climate change. Low temperatures and ample snowfall are a must for winter recreation — an industry that contributed more than $20 billion to the national economy in the 2015-2016 season. These conditions are under threat from warming winters, according to a new report from Climate Central. 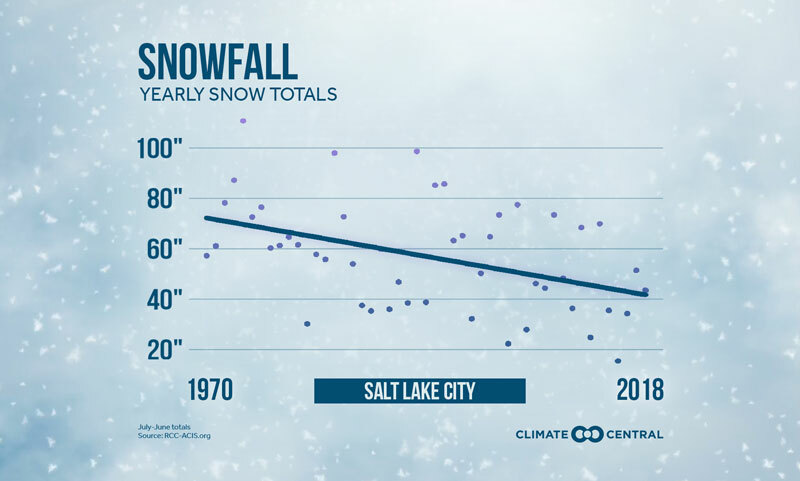 Warming is affecting regional snowfall patterns differently, but from the 1970s to 2010s, 57 of the 107 analyzed weather stations saw the average annual snowfall trend downward by at least an inch. The biggest losers were Flagstaff, Arizona; Salt Lake City, Utah; and Casper, Wyoming — all historically snowy Western cities that are getting drier overall. Since the 1970s, annual snowfall has dropped by a total of 48, 31, and 29 inches in those cities, respectively. Snow-friendly temperatures are declining across the country. 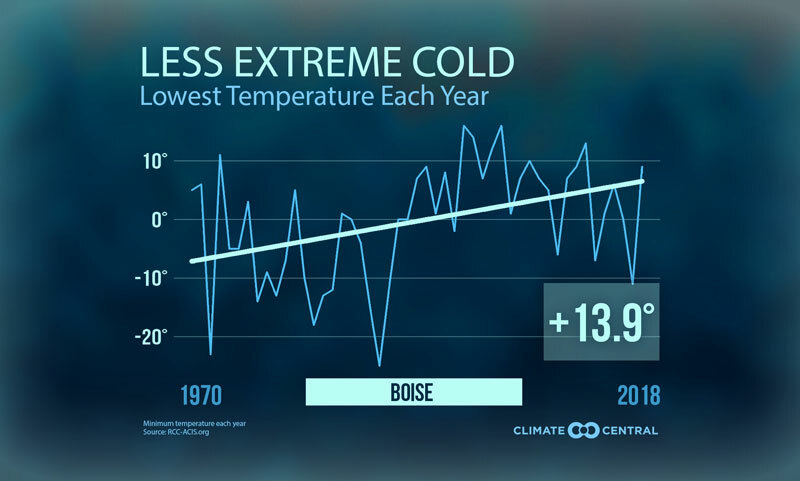 In the last half-century, winters have warmed by more than 2°F in 78 percent of the 244 cities analyzed. Seventeen cities have warmed by more than 5°F, led by a 7°F increase in Burlington, Vermont. And according to Climate Impact Lab, every state in the contiguous U.S. will see fewer days with below-freezing lows by midcentury, shortening winter recreation seasons. Reducing our greenhouse gas emissions would limit these effects. In Colorado, the nation’s top winter sports economy, unchecked emissions would cause 34 fewer below-freezing days per year by the 2040-2059 period, compared to the 1981-2010 average. But if the world meets its Paris Agreement pledges to reduce emissions, Colorado could save 8 snow-friendly days per year. For the state’s 43,000 winter recreation jobs, a salvaged week could make a major difference. Methodology: Average winter (December through February) temperature and total annual (July through June) snowfall trends were calculated for 1970 to 2018 using data from the Applied Climate Information System. Local snowfall trends were calculated for stations with at least 10 inches of average annual snowfall, fewer than 10 percent of missing daily data, and at least five years of data in both the first and last decades of the study period (criteria based on Kunkel et al. 2009). The projected number of days with a minimum temperature below 32°F (under RCP 8.5 and RCP 4.5) are multi-model averages obtained from the Climate Impact Lab. More information about the methodology can be found on their website. Cold Nights Are Decreasing Across U.S.
For much of the country, winter is the fastest warming of the four seasons. 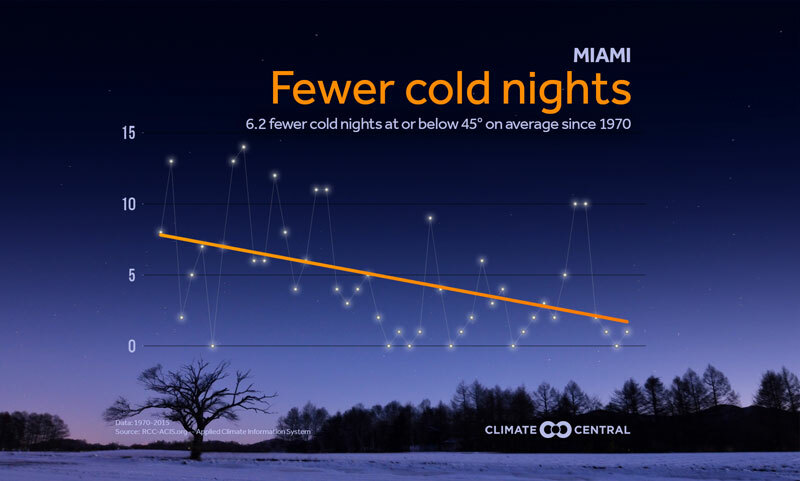 Not surprisingly, the average number of especially cold nights during the year is on the decline. Trends are not exactly the same in every location, but overall, the amount of cold is starting to wane.